Prof Christopher Leung, Professor of Department of Civil and Environmental Engineering of Hong Kong University of Science and Technology introduces R2M2 ‘Rapid Repairing Mortar Materials’. 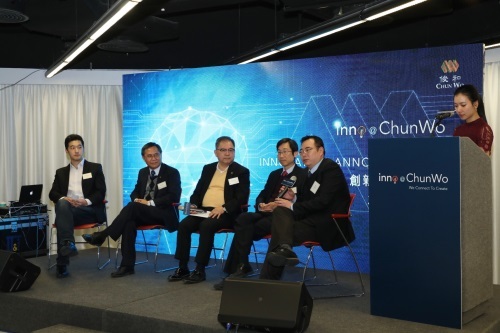 HONG KONG – (ACN Newswire) – Inno@ChunWo, established by Chun Wo Development Holdings Limited (“Chun Wo”), hosted an announcement on innovative technology at InnoCentre today. Since 2016, Inno@ChunWo has been active in collaborating with different universities and technology research companies and its hard work has been rewarded with the successful development of Rapid Repairing Mortar Materials to enhance the maintenance efficiency of ageing buildings. Meanwhile, Inno@ChunWo has successfully utilized Artificial Intelligence (A.I.) technology to improve construction safety. Mr Dominic Pang, Chairman of Asia Allied Infrastructure Holdings Limited (“AAI”), Sr. Stephen Lee, Chief Executive Officer of Chun Wo Construction Holdings Company Limited, Mr. David Lau, the Deputy Chief Operating Officer of Chun Wo Construction Holdings Company Limited, and R&D team members were present at the announcement to explain Inno@ChunWo‘s latest R&D achievements. 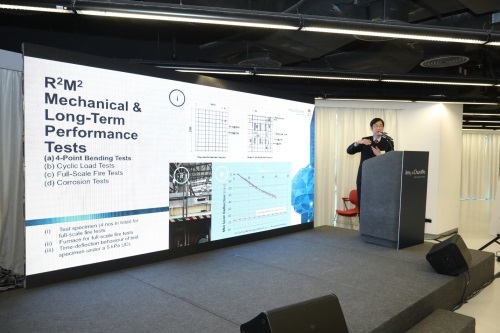 R2M2 is a collaborative research project under the Innovation and Technology Fund, undertaken by Chun Wo, the Hong Kong University of Science and Technology (HKUST) and the Nano and Advanced Materials Institute Limited (NAMI). Comparing to the conventional method, R2M2 offers a safer and faster solution for repairing concrete spalling – an issue commonly seen in Hong Kong’s ageing buildings. R2M2 is a stainless-steel fiber reinforced mortar that recovers the lost load-carrying capacity of corroded rebars by simply patching alone. It mitigates the need for lapping a new rebar and breaking a large volume of good concrete on both sides of the corroded region for lap length. In short, it simplifies the conventional repairing procedures, shortens the repair time and generates less waste, noise and dust nuisance to the property owners. (Left to right) Mr. Gyubok Baik, Product Manager of Indus.ai; Prof Henry Chung, Professor of Department of Electronic Engineering, City University of Hong Kong; Prof Christopher Leung, Professor of Department of Civil and Environmental Engineering, Hong Kong University of Science and Technology; Sr. Stephen Lee, Chief Executive Officer of Chun Wo Construction Holdings Company Limited; Mr. Dominic Pang, Chairman of AAI; Mr. David Lau, the Deputy Chief Operating Officer of Chun Wo Construction Holdings Company Limited; Mr. Gary Chou, General Manager of Chun Wo Construction Holdings Company Limited; Prof Darwin Lau, Professor of Mechanical and Automation Engineering, Chinese University of Hong Kong and Mr. Ivan Sham, Director of Research development of Nano and Advanced Materials Institute Limited attend the announcement to explain Inno@ChunWo‘s R&D achievements. 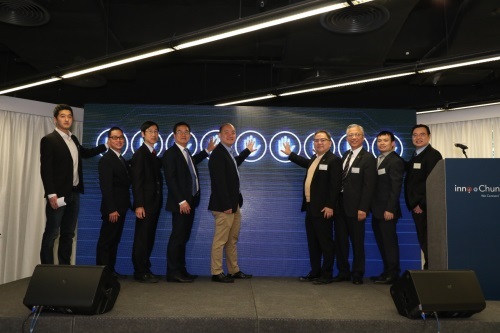 Asia Allied Infrastructure Holdings Limited (“Asia Allied Infrastructure”) is listed on the Main Board of the Hong Kong Stock Exchange under stock code 00711. It is engaged in various businesses including construction engineering and management, property development and assets leasing, security services and property management. With Hong Kong as its business development base, Asia Allied Infrastructure is also exploring development opportunities with Asia as the main focus, as well as in overseas markets. Its subsidiary “Chun Wo” is a renowned construction contractor and property developer in Hong Kong, which enables Asia Allied Infrastructure to capitalise on that company’s solid construction experience and professional capabilities to seize the opportunities for infrastructure development in countries nearby the “Greater Bay Area”, and, ultimately, to increase overall profitability and create higher investment value. Chun Wo Development Holdings Limited (“Chun Wo”) was founded in 1968 and is a key subsidiary of Asia Allied Infrastructure Holdings Limited (stock code: 00711.HK). The Company is principally engaged in the core construction and property development businesses with the professional capability to undertake large integrated construction projects. Recent examples of large infrastructure projects in Hong Kong within which the Company has undertaken works include the Central-Wan Chai Bypass, Liantang/Heung Yuen Wai Boundary Infrastructure, the Hong Kong-Zhuhai-Macao Bridge Passenger Clearance Building, the Guangzhou-Shenzhen-Hong Kong Express Rail Link (Hong Kong Section) and the MTR Shatin to Central Link. With deep roots in Hong Kong for nearly 50 years, Chun Wo has accumulated extensive experience and a strong position in the construction sector enabling it to expand business to countries along the “Belt & Road” route in Southeast Asia. Examples of such expansion are the acquisition of a construction and engineering consultancy in Singapore and the waterway bridge design and construction projects undertaken in the Philippines during recent years.